Josh Brown|Miami Valley Today Miami East’s Tyler Kirby is congratulate by teammate Jonah Wolf after scoring a run Tuesday against Bradford at Miami East High School. Josh Brown|Miami Valley Today Bradford’s Nylani Birice drives a double to right field Tuesday against Miami East. Josh Brown|Miami Valley Today Miami East second baseman Alex Hayes throws to first to complete a double play Tuesday against Bradford. Josh Brown|Miami Valley Today Miami East’s Kalli Teeters scores ahead of the tag of Bradford catcher Elisa Martinez Tuesday. Josh Brown|Miami Valley Today Bradford second baseman Gavin Trevino throws to first as he falls backwards Tuesday against Miami East. 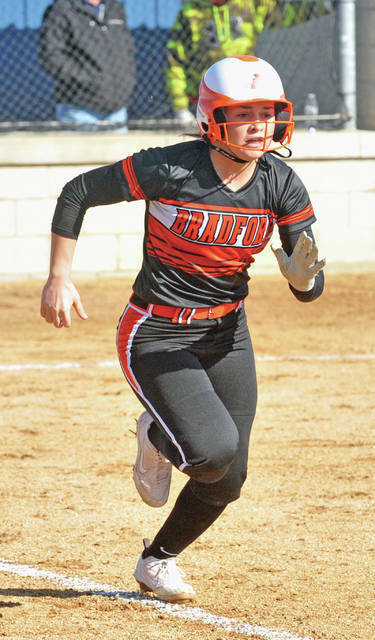 Josh Brown|Miami Valley Today Bradford second baseman Emma Canan (7), shortstop Austy Miller (4) and center fielder Rylee Canan (22) can’t come up with a popup Tuesday against Miami East. 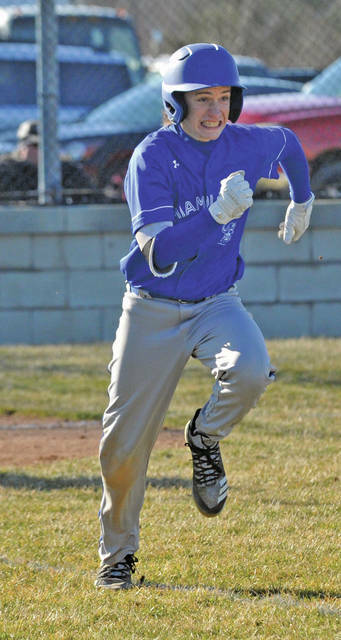 Josh Brown|Miami Valley Today Miami East’s Garrett LeMaster runs to first base Tuesday against Bradford. Josh Brown|Miami Valley Today Miami East center fielder Cassidy Walker gets the ball back to the infield Tuesday against Bradford. 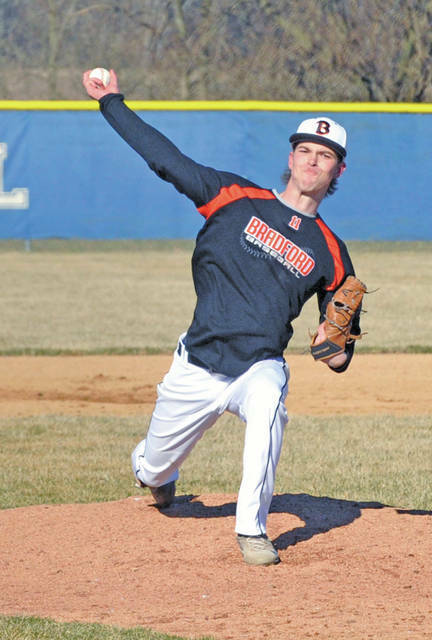 Josh Brown|Miami Valley Today Bradford’s Larkin Painter pitches Tuesday against Miami East. Josh Brown|Miami Valley Today Bradford’s Austy Miller races to first base Tuesday against Miami East. Josh Brown|Miami Valley Today Miami East pitcher Kyleigh Kirby throws to first for an out Tuesday against Bradford. Josh Brown|Miami Valley Today Miami East’s Tyler Kirby pitches Tuesday against Bradford. 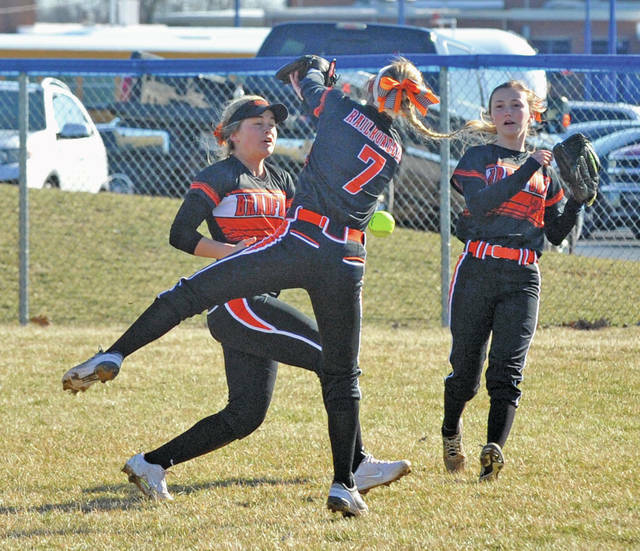 CASSTOWN — The Bradford softball team survived an off day to continue its hot start. Miami East’s baseball team got a stellar start from a sophomore pitcher and did enough little things to win. In the end, it was a split between the two schools as the Railroader softball team improved to 3-0 after a 6-4 victory over the Vikings, while Miami East’s Tyler Kirby came one seventh-inning dropped fly ball away from a shutout in a 6-1 win over the Bradford baseball team in Cross County Conference play Tuesday at Miami East High School. 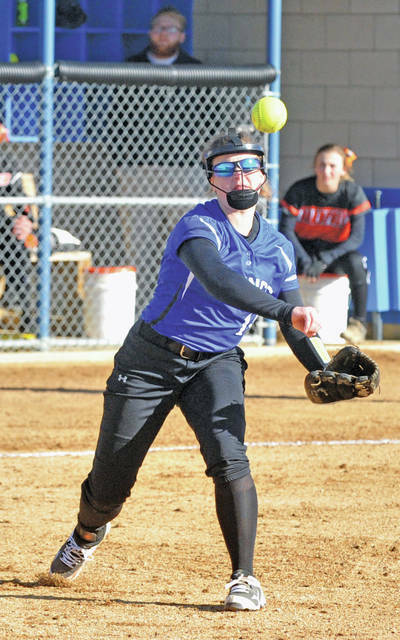 For Bradford’s softball team, the pressure is high to perform this season after a historic year last year that saw the Railroaders reach the state tournament. 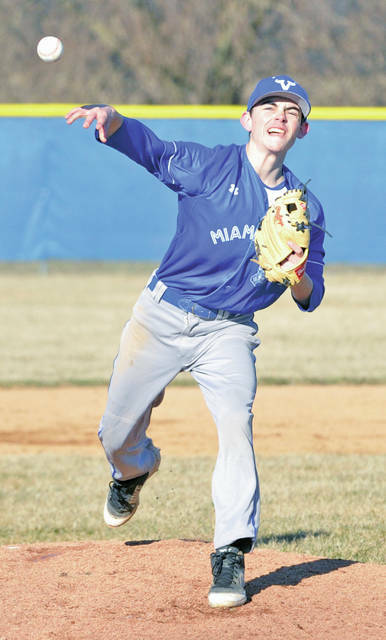 Tuesday was not one of those days, though, as Bradford (3-0, 1-0 CCC) committed an uncharacteristic four errors and allowed three unearned runs in the game as Miami East (0-1, 0-1 CCC) remained within one run at 3-2 after three innings. A three-run top of the fourth by the Railroaders, though, gave them enough of a cushion to hang on as they capitalized on five Viking errors themselves. “We didn’t play well in any aspect today, but we came out with the ‘W,’” Schaffer said. “(Pitcher) Nylani (Birice) got it done when she had to. This wasn’t her best game by far and she knows that, but we worked through it. Birice went the distance on the mound, giving up only three hits and one earned run and striking out two but giving up six walks, as well as hitting a double at the plate. Elisa Martinez was 2 for 2 with an RBI, Austy Miller was 2 for 4 with a run scored and Macie Reck drove in two runs to lead the Bradford offense. Miami East, meanwhile, had its chances, particularly in the seventh inning. Sam Urban drew a leadoff walk and Kyleigh Kirby walked with one out to put the potential tying runs on base, but Birice got a popout and groundout to close out the game. Kirby went the distance for the Vikings on the mound, striking out four and walking three while giving up eight hits and six runs — only three of which were earned. “Kyleigh is a freshman, but she’s a good pitcher. 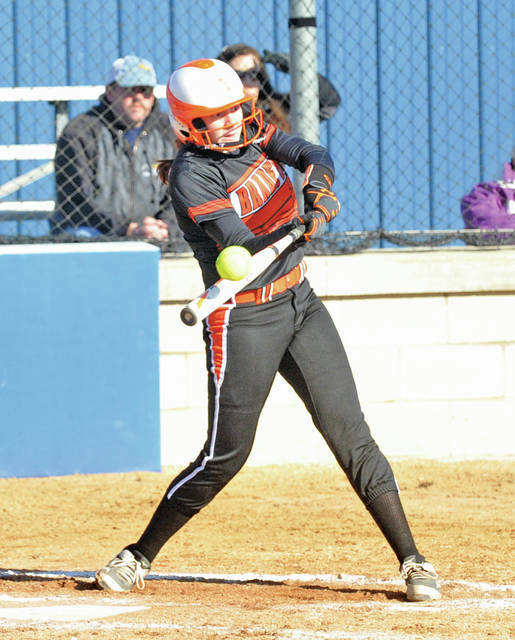 She’s pitched in a bunch of big games,” Kadel said. “Defensively, we gave away some runs. Twice we fielded the ball and girls were halfway down the line at third — if we turn, we can get that runner. We have to be able to take advantage when people give us opportunities to get lead runners, but we’re not quite there yet. Offensively, Abigail Covault was 1 for 3 with an RBI, Kalli Teeters doubled and Paige Lawson drove in a run. Miami East travels to Springfield Shawnee Wednesday, while Bradford takes on National Trail Thursday. And in the baseball game, Miami East starter Tyler Kirby was in control from start to finish, scattering five hits, walking none and not giving up an earned run while striking out eight. Bradford (0-3, 0-1 CCC) had a chance to get back into the game in the top of the sixth inning. Trailing 4-0, the Railroaders loaded the bases with only one out against Kirby — but the sophomore buckled down and got a swinging strikeout on a full count for the second out of the inning, then he induced a meek popout to the right side to get out of the jam unscathed. From there, Jonah Wolf hit a two-run double in the bottom of the sixth to give the Vikings (1-1, 1-0 CCC) a six-run lead, plenty for Kirby to work with in the seventh. Offensively for Miami East, Andy Wargo was 2 for 3 with an RBI, A. Francis was 2 for 4, G. Butz was 2 for 2, Wolf had a double and two RBIs and Dave Osting drove in a run. For Bradford, Fischer Spencer was 3 for 3 and Hunter Gheen scored the lone run on an error in the top of the seventh. Starting pitcher Larkin Painter took the loss, giving up six runs — three earned — on six hits and four walks while striking out three in five innings of work. 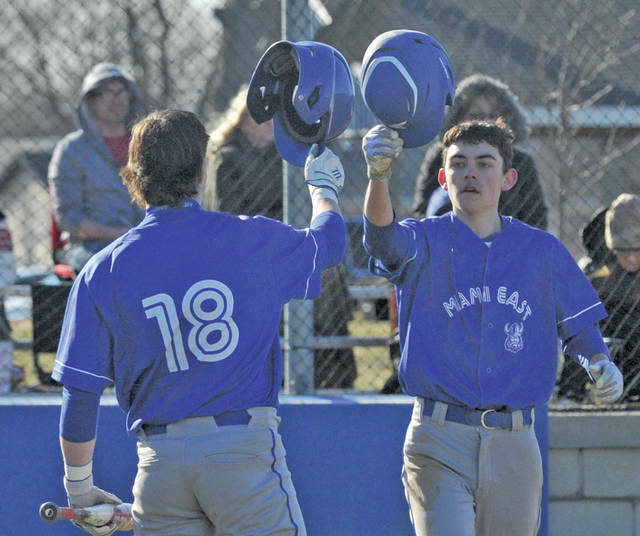 https://www.tdn-net.com/wp-content/uploads/sites/21/2019/03/web1_032619jb_me_tylerkirby_18-1.jpgJosh Brown|Miami Valley Today Miami East’s Tyler Kirby is congratulate by teammate Jonah Wolf after scoring a run Tuesday against Bradford at Miami East High School. https://www.tdn-net.com/wp-content/uploads/sites/21/2019/03/web1_032619jb_brad_24-1.jpgJosh Brown|Miami Valley Today Bradford’s Nylani Birice drives a double to right field Tuesday against Miami East. https://www.tdn-net.com/wp-content/uploads/sites/21/2019/03/web1_032619jb_me_alexhayes-1.jpgJosh Brown|Miami Valley Today Miami East second baseman Alex Hayes throws to first to complete a double play Tuesday against Bradford. 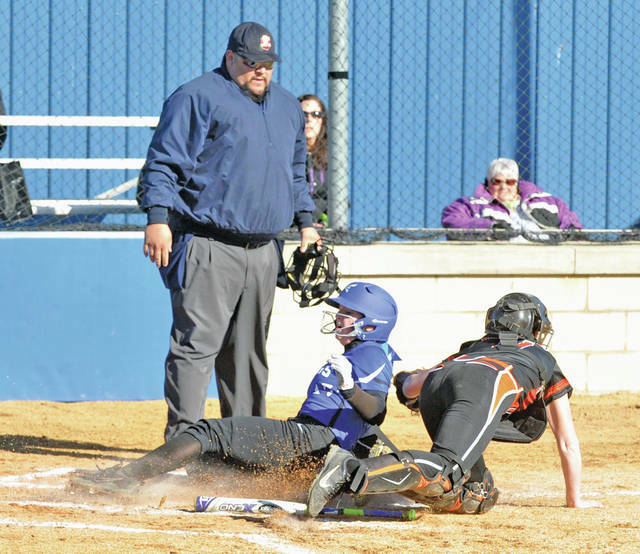 https://www.tdn-net.com/wp-content/uploads/sites/21/2019/03/web1_032619jb_me_17-1.jpgJosh Brown|Miami Valley Today Miami East’s Kalli Teeters scores ahead of the tag of Bradford catcher Elisa Martinez Tuesday. 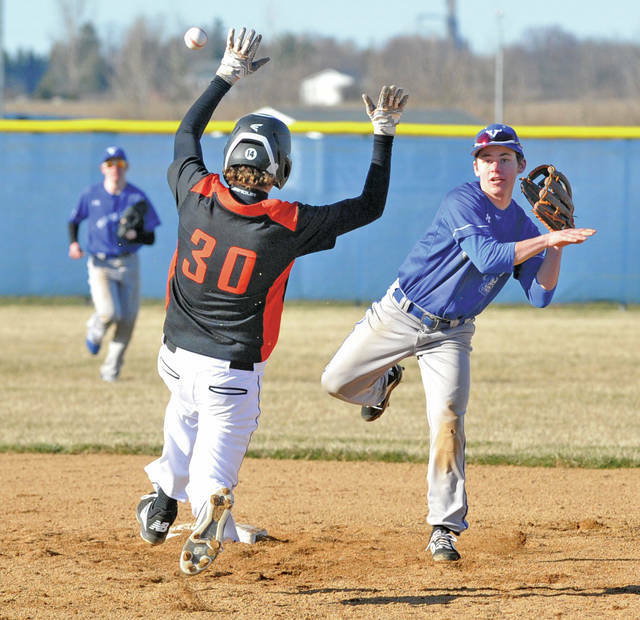 https://www.tdn-net.com/wp-content/uploads/sites/21/2019/03/web1_032619jb_brad_gavintrevino-1.jpgJosh Brown|Miami Valley Today Bradford second baseman Gavin Trevino throws to first as he falls backwards Tuesday against Miami East. 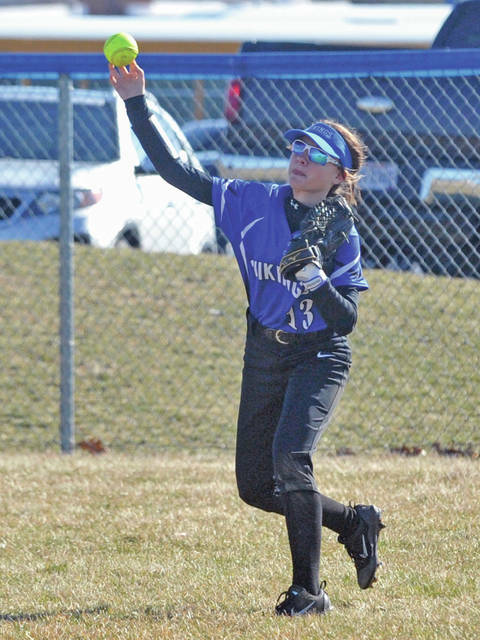 https://www.tdn-net.com/wp-content/uploads/sites/21/2019/03/web1_032619jb_brad_2B_SS_CF-1.jpgJosh Brown|Miami Valley Today Bradford second baseman Emma Canan (7), shortstop Austy Miller (4) and center fielder Rylee Canan (22) can’t come up with a popup Tuesday against Miami East. https://www.tdn-net.com/wp-content/uploads/sites/21/2019/03/web1_032619jb_me_garrettlemaster-1.jpgJosh Brown|Miami Valley Today Miami East’s Garrett LeMaster runs to first base Tuesday against Bradford. https://www.tdn-net.com/wp-content/uploads/sites/21/2019/03/web1_032619jb_me_CF-1.jpgJosh Brown|Miami Valley Today Miami East center fielder Cassidy Walker gets the ball back to the infield Tuesday against Bradford. https://www.tdn-net.com/wp-content/uploads/sites/21/2019/03/web1_032619jb_brad_larkinpainter-1.jpgJosh Brown|Miami Valley Today Bradford’s Larkin Painter pitches Tuesday against Miami East. 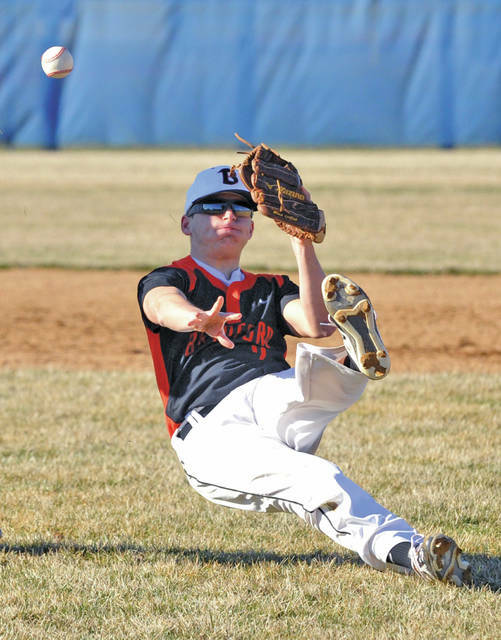 https://www.tdn-net.com/wp-content/uploads/sites/21/2019/03/web1_032619jb_brad_austymiller-1.jpgJosh Brown|Miami Valley Today Bradford’s Austy Miller races to first base Tuesday against Miami East. https://www.tdn-net.com/wp-content/uploads/sites/21/2019/03/web1_032619jb_me_kyleighkirby-1.jpgJosh Brown|Miami Valley Today Miami East pitcher Kyleigh Kirby throws to first for an out Tuesday against Bradford. https://www.tdn-net.com/wp-content/uploads/sites/21/2019/03/web1_032619jb_me_tylerkirby-1.jpgJosh Brown|Miami Valley Today Miami East’s Tyler Kirby pitches Tuesday against Bradford.